"So what do you do?" I used to dread this question being asked when meeting new people. I used to feel really uncomfortable and more often than not would utter the words "I'm just a mum at the moment" followed by justifying my reasons behind our decision for me to stay at home after my maternity leave ended with Miss Boo. 4 years on I am far more confident in my response and able to say that "I am currently at home with my children", I do still find myself offering excuses as to why though and I have no idea why I do it. I am so proud to have grown 3 perfect little ladies and so proud to have brought them into the world and teach them all about it. In fact I'm never prouder than when I look at my girls. 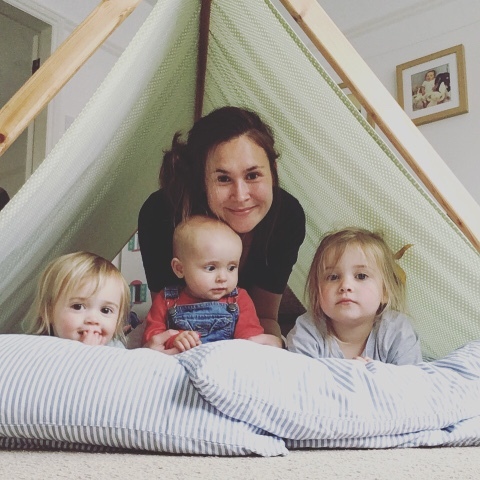 The decision for me to be at home is the right one for our family and I'm so much more than "just a mum" and I need to be proud of my current profession. However I think sometimes the words 'just a mum' come out because some days I'd like to be more than that. Being at home full time is an absolute privilege I know, but sometimes it's really hard and the day to day grind can be, well, a little bit boring... We get out everyday to do something because a lot of the time I crave adult company and conversation. I also feel that because I am at home full time and it's my current 'profession' that I need to do it well, so I've thrown myself into it wholeheartedly. There is no official appraisal system for mothers, no one to one, no bonus scheme. There are days I guess you have in any job, days where you feel self doubt, under appreciated, overworked, stressed, frustrated. Days when everything is a challenge and your co - workers are driving you crazy (although hopefully not screaming on the office floor or pulling each others hair) Then there are the great days where things go well, you meet your targets (packing the dishwasher, cooking a meal and putting some washing on!) meetings are productive (play dates) and everything is running to schedule in perfect harmony. There is no annual leave, no sick leave and no wage. It's a 24 hour a day, 365 day shift with on the job training and it's quite hard to clock out. I don't think I fully appreciated this before I took on the role and I've been winging it ever since wondering if I'm doing it right as I'm pretty sure most mums are.The affirmation we are doing a good job mamas is right there in front of us in the form of our children and despite the tough days we are paid substantially in smiles, laughter, cuddles, kisses, fun, moments that absolutely take your breath away and fill you with happy tears. Most of all we have the honour of being the most important person in the world to them. Bringing up the next generation of human beings is a huge responsibility and takes a lot of hard work, dedication and love. There is real value in that and no 'just' about it.